Hardware modders, perhaps frustrated by the Android-based device’s poor performance, gave the Barnes & Noble Nook a quick fix—they turned it into a Web tablet. According to the nookDevs forum, modders found a way to turn Barnes & Noble’s $259 Nook e-reader into a portable computer with free 3G Internet access. Unfortunately, this clever modifaction violates the Nook’s warranty and user agreement, and according to developers to modify the e-reader takes a grand amount of technical skill—meaning: don’t try this at home consumers. Many blogs note this as a major deterrent to people mucking around with the Nook. No seriously, listen up disappointed Nook customer—before you tear open your shiny new e-reader, take some consideration and preparation of the Nook hacking process. If you do this correctly, the Nook will be a computer tablet running on a full Android operating system with a built-in, free cellular internet connection, and an incredibly long lasting battery. Sounds pretty good to us. 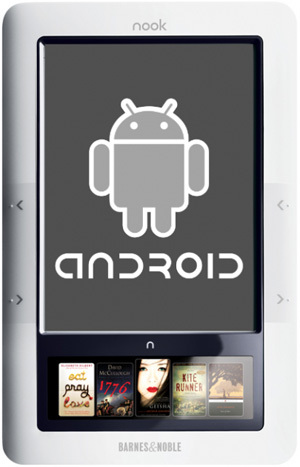 Check out nookDevs Wiki instructions on how to hack the Nook.